This is a story about tennis players who may not make the Associated Press or the nightly national news. No results about Roger, Justine, Rafael, or Svetlana. This is about USTA members who play tennis with intensity and live life with a passion. Jo Cusick is 80 years old and adores tennis. She has been an avid fan and supporter for over 30 years. 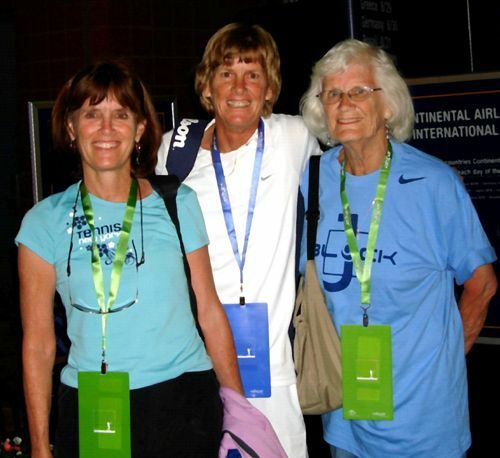 She has seen it all – from make shifts courts in the back yard and driveway to the US Open in Flushing Meadows. There is nothing Jo would rather do than spend a weekend watching her two daughters and their friends play tennis. It was no surprise to see Jo at the Arrowhead Senior Open this past weekend. Her girls, Jane and Nan, and many of their friends were competing in the tournament and the action was heated and intense. But this tournament had an unusual twist. Midway through the final day, Jo was watching a final when she became dizzy. She lost her balance and fell to the ground, hitting her head on the pavement. Every person in the vicinity rushed to her aid. Carrie, Jill, Allison, Linda, Kim and Rob ran to help. Craig, Hank, Jeanne, and Joe jumped to offer assistance. And Jo, true to form, insisted she was fine and kept asking “Don’t you all have tennis to play?”	This was a moment when tennis took a back seat to life. The matches could wait. Jo needed help. This was a day when the USTA truly shined. Yes, it was a day about tennis but, most importantly, it was a day about people. Some of the best tennis players in Phoenix were there when needed most – but not to hit an ace or a winning backhand. They were there to help someone in need. It was on this day that the true meaning of the USTA – to promote and develop tennis and to support tennis enthusiasts – became evident. This day made me proud to be a member of the tennis community and proud to know so many good people are in my life. For this I am forever grateful. Jo is doing fine now and will be back at the next tournament.